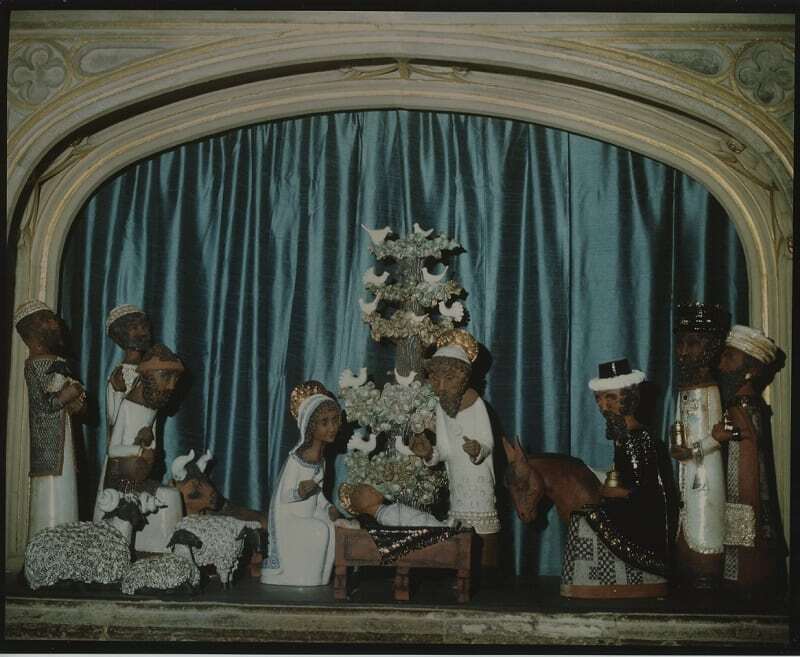 The nativity scene designed by Ben and Barbara Holgate in its intended location under the archway of the Oliver King Chapel. In 1980, the Dean and Canons of Windsor commissioned Ben Holgate to design and sculpt fourteen crib figures for St George’s Chapel. These delightful tin-glazed earthenware characters continue to make an annual appearance in the Chapel in December in commemoration of the birth of Jesus. Canon Eastman, then holding the post of ‘Master of the Fabric’ at St George’s Chapel, seems to have been the prime mover behind the idea to commission crib figures. 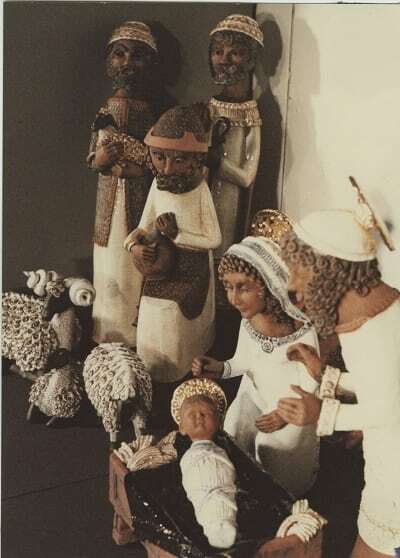 On 5 February 1980 he raised the subject at a meeting of Chapter and it was agreed that he should contact the Art Department of Eton College to design some Nativity figures. When this initiative failed to produce the desired result, the Dean and Canons agreed to assign the commission to a professional sculptor, Ben Holgate, who had been recommended to Canon Eastman by Canon Bill Lockett, a friend who was Senior Lecturer in Art at the Institute of Extension Studies at Liverpool University. On 14 May 1980 an order was placed ‘for fourteen crib figures, to be placed under the archway of the Oliver King Chantry’. The figures, which were sculpted by Benjamin and Barbara Holgate at a cost of £600, were paid for and presented to the Chapel in 1980 by the Friends of St George’s and Descendants of the Knights of the Garter. They comprise the infant Jesus resting in a manger (an animal feeding-trough used as a makeshift crib), his parents, Mary and Joseph, the Shepherds and Wise Men who came to visit the Holy Child, an ox, a donkey and assorted sheep. The Holgates also supplied a representation of the ‘Tree of Life’ to add to the Nativity scene. Ben Holgate trained at the Liverpool College of Art and later at Burslem and Loughborough Colleges. In the 1980s he specialised in tin-glazed earthenware sculptures with majolica and lustre decoration and was Head of Art Studies at St Martin’s College, Lancaster. His wife, Barbara commenced her ceramic training in the City of Birmingham College and subsequently at the Loughborough College of Pottery. They ran a business called ‘Ben and Barbara Holgate Ceramic Sculpture’ from Heatherdene studio in Lancaster. A group of Holgate’s crib figures showing Mary and Joseph with the baby Jesus and three shepherds with their sheep. The St George’s crib was designed for the Oliver King Chapel, to be displayed in the space under the arch, as shown in the photograph above. When the ‘Tree of the Life’ and two figures were damaged in a freak wind in 1984, the Holgates replaced the tree with a new version, free of charge by their insistence. Fortunately the damaged figures were able to be repaired by the Clerk of Works team with aid of some glue. Since 1987, when a metal screen by Andrew L. Smith was inserted within the Oliver King Chapel arch, the crib has been displayed elsewhere in St George’s Chapel at Christmastide. In recent years it has been placed in front of the Nave altar, for the enjoyment of those visiting and participating in the Christmas services in the Chapel. Details for all Christmas services and concerts to be held at St George’s Chapel this year can be found on the website.